This version has a solid centre. 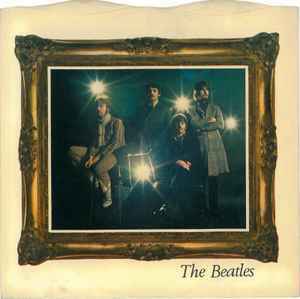 EMI reissued this (along with all other 7" Beatles singles) in 1976 in a green and white sleeve using the same catalogue number. I really like both songs especially the psychedelic "Strawberry Fields Forever"
The picture sleeve looks very nice. Just like previous single (albeit its B-side, "Rain"), this one was also subject to discussions about backmasking. And yes, "Strawberry Fields Forever" in reverse sound very much like "A Pair Of Sleepy Red Moose"... however, this was not intended as such by the band.